This is a Sponsored post written by CG on behalf of Teva. All opinions are 100% mine. Comfort and style should go together, especially during festival season! That's where Teva Original Sandals come in. Teva Original Sandals are built to last, and are one of the most comfortable sandals out there. Durable and versatile, the Original Sandal will see you through adventure after adventure. Since 1984, Teva has been a brand devoted to being the go-to shoe for anyone who wants to go anywhere, do anything, and live life for those unscripted moments that make the best memories and adventures. 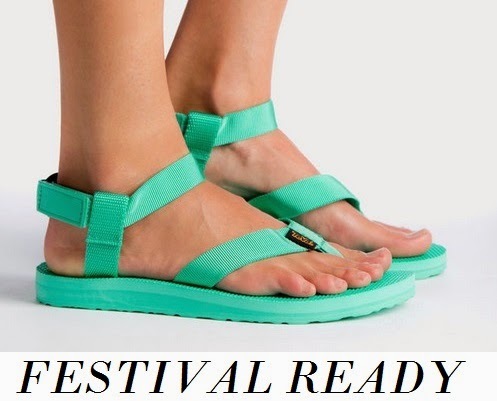 Teva sandals and flip flops are available at Zappos. They have a variety of bright colors that I really love. My favorite is the teal pair, which would be perfect paired with white shorts, a crop top, and an over-sized cardigan for cooler nights. 1. Keep hydrated: It's easy to get caught up in the music and the fun, but make sure to drink plenty of water! A combination of sun, dancing, and alcohol can quickly dehydrate you. Have a water bottle with you at all times. 2. Bring extra clothing: When the temperature drops at night, you'll want an extra layer or two, especially if you've been sweating throughout the day. 3. Bring shade: Whether it's sunglasses, a tent, or a hat, bring some shade with you! Being outside all day in the sun can give you a terrible sunburn, not to mention heatstroke. Stick to some shade when you can, and don't forget the sunscreen. Check out more festival tips at Bonnaroo's The Fountain and posts tagged #ready2roo. What are your festival tips?